Renault Magnum, restyled and modernized, expresses power and robustness of the new pavillon line cab side deflectors aerodynamics, sun visor and handle rise in the front. The bumper in 3 colours, is made from sturdy materials and is equipped with a central painted the same colour of the grill and of a step-in to the non-slip windshield. Renault Magnum is equipped with new engines Euro 5, more powerful and more sober in fuel consumption. The gearbox Optidriver+, ideal complement to the DXi engines, becomes a standard fitting out. It contributes to the reduction of consumption and so doing, to the company’s profitability. Renault Magnum is the great road for its exceptionality enhancing the customer’s corporate image. 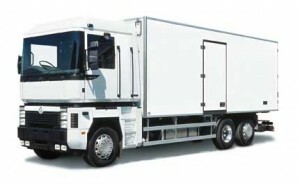 The F.lli Benaglio is specialized in the production of cold storage for refrigerated truck Renault Magnum 440 6 X 2 and puts at your disposal its expertise for advice and a customized proposal.